As we move around in this world there are moments of clarity that occur. Yes, I can see myself in her, sans the bustle. Because in my head I have a vision for this new house, having closed on the sale of the old one last week. I have a vision of things in their “place,” good smells and pleasing views. I have a vision of tidiness and order and coziness and comfort. Interviewing to fill a vacancy, one I’ve covered for months now. And, after that, on boarding someone new, training, policy, understanding, compliance and meeting all deadlines in the interim. Add to that a new organizational structure, new boss(es), new, new, more, more. Conference calls. Meetings. Travel. Repeat. And Hubbs gimping around with a sore back. So I’ve padded up my Labor Day weekend with a couple days off and maybe then I’ll make some headway. Maybe then our living room will transform into the “Home & Garden” vision in my head. Maybe then. Still, the aroma of a roasted meal lingers in the kitchen this morning. The counters are clear from last night’s efforts. Progress – albeit slow – is there, if I let myself see it. Youngest boy even declared “Mom, it smells like home in here” and his joyful statement helped me see that maybe we’re already there and not much more is needed anyways. Home is something I feel. When we were house hunting I would get that “home” feeling when the house was right. Can’t explain it but I’m sure it’s stuff from my childhood. I like big trees and porches (front or back) and a place or the cat food. 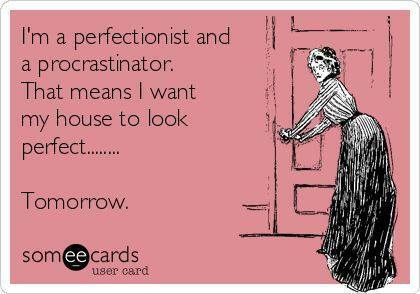 I saw this e-card last week and thought it was perfect! I know what you mean, I always want to be settled immediately when we have a new space. I’ve finally learned though, that I benefit from taking it slow and letting things be a work in progress…I’ve often changed my mind about paint colors, furniture choices, and other variables, as I sit with a space and grow into it. The last home I settled took a year to make into “my” space…repainted all the rooms, re-did the floors, and gradually added some furnishings that made it home. Ahhh…satisfying! Aw…..you have a lot on your plate right now. It will come in time. Be patient with yourself! The more time goes the homier your new home will feel. You are on the way! Your son said it all, dear lady. The rest will come with time. Mmm… this is just the reminder I needed as an in-progress room addition continues to remind me of its ever unfinished-ness. New windows throughout the house require staining, and then window treatments. And the yard outside the new addition is going to require work that will have to wait until next spring, most likely. Not sure when any of this will be completely done. I too see everything in its completed state, while recognizing all of it is a long way off for many of the same reasons you cite. My work life is insane. Caring for Mom takes precedence over working on the home improvements. And we’re taking the long Labor Day weekend to spend time away at the cabin with family. And that feels more right than staying home and tackling projects we can’t finish in a weekend anyway.